As a Master of Flavor correspondent for Grill Mates® I'm posting a series of recipes and videos that feature some of the latest flavor trends, tips and techniques from the Grilling Edition of the annual McCormick Flavor Forecast. This time out I demonstrate how to use Grill Mates® Mexican Fiesta marinade mix to transform an ordinary burger into a masterpiece signature burger. Along the way I share some great tips that will help make you a serious backyard burger-meister. This recipe starts with a mixture of two types of ground beef and the Grill Mates® maridade mix; and we finish with melted pepper jack cheese, grilled green chiles, and a tangy ancho-lime mayonnaise. Again, this is a serious signature burger that packs huge flavor and wow-factor. Note: If you can't find ground chuck and/or sirloin, simply use 80/20 ground beef. Combine all of the ground beef, the marinade mix, and the water in a medium mixing bowl. Use your hands to mix the ingredients very well. Yes, it's messy. Divide the meat into four equal portions and form them into evenly-sized patties 1/2" thick patties (about six inches in diameter). Sprinkle both sides of each patty with pepper. Wash the peppers under cold water and drain well. Remove the stem end of each pepper, and about 1/2" of the tip end. Slice each pepper lengthwise and remove the seeds and veins. Put the peppers in a zip-top bag and seal the bag 3/4 of the way. Microwave the peppers in the bag at medium-high for two minutes. Remove the peppers from the bag and onto a plate, and let cool. Prepare your grill for direct and indirect cooking at medium-high heat (about 425º). Lightly oil both sides of each burger with the canola oil spray. Grill the burgers over direct heat for three minutes. Combine all of the mayonnaise ingredients in a small mixing bowl, whisk well and set aside. Add the peppers, skin side down, to the open spaces of the grill. Flip the burgers and cook them another three minutes. 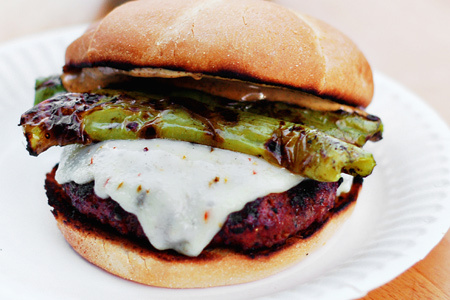 Top each burger with two slices of grilled green chile. Put each burger on a bun and smear each bun top with a good dose of the ancho-lime mayo. Fantastic job, John. Great recipe, tips, and video. You nailed this one. I've used the Fiesta marinade but hadn't tried it in burgers like this. Very good idea. Question; Why do you poke a hole in the center of the burger? Is it to keep it from rounding up and getting too thick in the center? Burger looks great btw; I really enjoy your web site! These look so good! The spices all sounds great together. Is it a really bold spicy or how is the spice level on these? I've never poked a hole in the center of the burger before cooking, definitely going to have to try that trick out sometime. Liz - The heat level is about a three on a 1-10 scale. Omg... yum yum gotta try this!